Most of us have become quite comfortable living and working with computers. We use them for everything – staying in touch with family and friends, searching for jobs, shopping, booking trips, checking the news, paying bills, and even keeping up with our kid’s grades at school. And of course we use them at work – that’s where all that comfort and familiarity can create problems. In the current cost-cutting environment many employers are looking for reasons to eliminate people from the payroll. Excessive or careless use of the internet at work can be every bit as damaging to your tenure as poor work habits or calling out sick too often. Part of the problem with internet use is that we don’t always know when we’re stepping over the line. After all so much about the web has become so familiar that we may not be certain that there even is a line. But there is definitely a line out there. Here are some behaviors to avoid that just might save your job. 1. Too much personal use of email. Most employers are tolerant of a reasonable amount of personal email running through their system, but a high number of them can signify that you’re spending more time on your outside activities than on your work. 2. Sending your resume through company email. At a minimum this tells your employer that you’re looking to leave the company, and few actions on your part can put your head on the chopping block as quickly. The resume on file with the human resources department should be the only copy that ever hits your employer’s system. 3. Applying for jobs online. This is an easy behavior to get into especially if you’re not happy on the job. But doing this can get you booted out before you’re ready to go. Most companies monitor internet usage and job websites will be flagged. 4. Using social media. Social media is all about transparency and our employers don’t need to know that much about us. Additionally social media sites are where we naturally tend to be casual, and that doesn’t always go over well at the office. Loose lips sink ships! Or in this case, your job. 5. Web surfing or shopping online. As harmless as this might seem to you, your employer may view it as your having too much free time on your hands. 6. Personal use of employer web applications. There are any number of ways that this can happen with different applications in different environments, but make sure you aren’t participating in it. For example, let’s say you work for a lender who runs credit reports. A few times a year you might run your own credit report, and even some for a few of your friends. Not only does this cost your employer money, but it also opens them up to legal ramifications. 7. Disclosing sensitive employer or client information on email or elsewhere on the web. This is a lot easier than we might think when it comes to emails. We talk about company and client business all day at work and we’re also on email. The combination of the two can create a situation where we disclose sensitive information to the wrong party. You can back away from nearly anything you say, but when it’s in an email or on a website you won’t be able to deny it. 8. Complaining about your job, your coworkers, your boss, or the company via e-mail. You have a disagreement with a coworker, your boss gives you a bad review, or the company cuts the benefit package and you’re ticked. In the old days we’d grumble to coworkers or pick up the phone and call an outsider – now we write emails. Don’t! Your employer’s email system is not the forum to vent about your employer! 9. Paying bills online. Apart from an employers concern about having too much free time in your day this is something that can get you into trouble in a different direction. You have no idea who in your company might have access to what it is your doing online or what it is they might do with your personal information. A substantial amount of identity theft comes from inside companies from people we’re supposed to trust. You could be jeopardizing your own security for convenience. 10. Disclosing personal information on email. Most of us have situations going on in our personal lives that we don’t want to bring to the office. By disclosing this information on your employer’s email you might be doing just that. What your employer might do with that information…will be up to your employer. Keep these points in mind when you’re on your employer’s computer and feeling a little too… comfortable! They could help you to avoid being a victim of your employer’s next cost-cutting program. 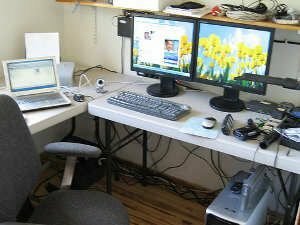 Do you have any stories to share about using your employer’s computer—anything that happened to you or to people you know? Should I work as a salaried w2 employee or a 1099 contractor? Why Do Employers Check Credit History? krantcents – WOW, talk about overlooking the obvious! You’re so right. It isn’t hard to envision that happening in a gradual evolution. You start out on the job doing mostly company business, then you mix in a little bit of personal. Over time, and without management comment, you gradually increase the amount of personal time while cutting back business time. It’s so easy to do that since time on the web disappears so quickly, especially if you do multiple functions (check and repond to personal email, check stock prices, read a couple of articles, etc.). Very good point! All good advice, I think I would add excessive personal use of the internet will also get you in trouble. Hi Steve – It’s good that you work in a more relaxed environment. Still, I’d be careful posting anything on the web while at work. You never know who’s looking, and how they’ll interpret what you’ve said or done. It’s probably true that most people who get into trouble using the web at work didn’t think they were doing anything wrong. So much of it is up to interpretation. I work at a hospital (here in Denmark). We have an 7.5/8 hour working shift, where we’re entitled to take breaks, but if anything comes up while we’re taking a break, we should do it. I always think it’s risky (or worth bosses checking, depending on your point of view), if you’re checking into things like Foursquare, Gowalla, etc, when you could reasonably be expected to be working. I never use Facebook on the work computers – never have the inclination, really – but I have checked in to Foursquare. However, I make it absolutely clear that I’m doing it on my break.